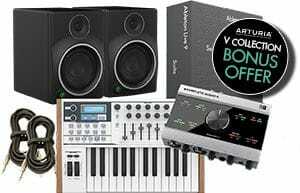 Student Saver Bundles combine everything you need to start making music from the get go. Powerful, full featured and at a price that won't hurt the hip pocket! Ableton Live Intro: A stripped down but highly powerful version of Abletons award winning Live Software. All of the Ableton essentials at a reduced price: 700+ sounds, 27 effects, 3 instruments, 16 audio and midi tracks, 2 send return tracks and 4 audio inputs and outputs. Mackie CR3: 3" 50W 97dB studio monitors created using premium, high performance components. Designed with an active and a passive studio monitor, requiring only one speaker to be plugged into power. Handy features include: Front panel volume/power control & AUX input, balanced TRS & unbalanced RCA rear input, Left/Right speaker placement switch. Korg Mikrokey 25: Highly portable 25-key midi keyboard with velocity-sensitive Natural Touch mini-keyboard. Octave Shift and Key Transpose features access the full MIDI note range. Versatile controls include arpeggiator buttons, sustain/tap button, and joystick. Plug and play computer connectivity; no need to install a driver and completely IOS compatible for use with iPad or iPhone. Tascam 2 x 2: Combines great audio quality and ergonomic design for a powerful 2-in/2-out USB 2 Audio interface. Two of TASCAM's Ultra-HDDA mic/line preamps provide up to 57dB of gain with nearly inaudible noise and distortion specs. The audio design features high-performance, musical components like NE5532 op amps for rich sound quality without colouring the source. The US-2x2 includes class-compliant drivers for plug-and-play operation on Mac OSX and iOS devices like the iPad, and a simple driver adds ASIO compatibility for Windows. MIDI in and out are also included for connecting synths, drum machines, and controllers. The interface includes two DAW applications to choose from both Cakewalk SONAR X3 LE and Abelton Live Lite 9. Student allowance just hit your bank account. 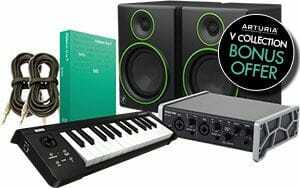 With this powerful but cost effective package you can be sure to pay the rent and make music! Ableton Live Standard: A fully featured version of live. Expands upon live intro by adding all audio manipulation and warping options, video import/export and groove management. Includes: 1100+ sounds, 3 instruments, 35 effects, unlimited audio and midi tracks, 12 send return tracks and 256 audio inputs and outputs. Mackie MR5: 5" 50W 108dB powered studio monitors specifically designed to reveal the full range and natural character your music deserves. Includes features such as an enhanced waveguide system for a wider sweet spot and custom-tuned rear porting for smooth, extended bass response. Class A/B amplification, XLR, TRS & RCA inputs and Customizable frequency control. Arturia Minilab: Made for the musician on the go or the performer with limited space, MiniLab offers a comprehensive set of features in a portable package that's sturdy and looks great. When combined with the included Analog Lab software, MiniLab becomes a real hybrid synthesizer with 5000 sounds from all Arturia software titles. 25 velocity-sensitive mini-keys with pitch and modulation touch-strip controls, two banks of velocity-sensitive backlit performance pads and 16 full-size rotary encoders, Recessed footswitch input and USB bus-power port make minilab a hybrid synth/controller powerhouse. NI Komplete Audio 6: Record and play back music with four analog ins/outs, digital in/out, MIDI, and low-latency performance all in a sleek, rugged metal casing. Two mic inputs armed with high-end pre-amps 48V phantom power and Cirrus Logic converters deliver pristine sound and up to 24bit / 96khz recording. Completely USB powered, with an extra sturdy custom USB socket. 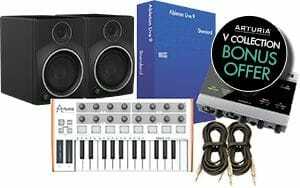 Included software: Komplete Elements, Cubase LE and Traktor LE. You received an inheritance! Now get to making some music with the most powerful and fully featured student saver bundle. Ableton Live Suite: The flagship version of live. Brings all the features of live standard with the addition of 6 instruments, 3 fx and the only version that includes Max for Live. Includes: 3000+ sounds, 9 instruments, 41 effects, unlimited audio and midi tracks, 12 send return tracks and 256 audio inputs and outputs. Arturia Keylab 25: Rugged metal and wood construction and small enough to take anywhere it's the perfect companion for the road or the studio. Take complete control wherever you go. 25 semi weighted velocity sensitive keys, 2 clickable encoders, 6 transport switches, pitch and modulation wheels, two banks of 10 encoders, 9 sliders, 1 volume encoder and 10 assignable switches make Keylab a hands on control center. Also included is Analog Lab software, which gives you access to thousands of the best sounds from the V-Collection library. A premium hardware controller, tightly integrated with the amazing Analog Lab software, makes for a hybrid synthesizer that is unmatched. Available now through authorised stockists.